An Aramco employee walks near an oil tank at Saudi Aramco's Ras Tanura oil refinery and oil terminal in Saudi Arabia May 21, 2018. 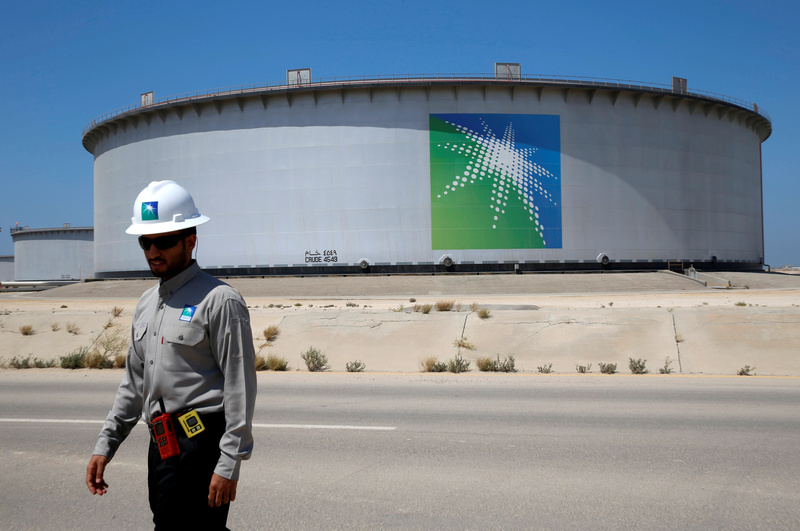 Saudi Aramco on March 27 agreed to buy a 70 percent stake in Saudi Basic Industries Corporation (SABIC) from Saudi Arabia’s sovereign wealth fund for $69.1 billion. SABIC and Aramco said in a statement the agreed purchase price was 123.4 riyals per share, a slight discount to SABIC’s closing price of 124.2 riyals on March 27. “This is a win-win-win transaction and a transformational deal for three of Saudi Arabia’s most important economic entities,” Yasir Al Rumayyan, managing director of the Public Investment Fund, said. Aramco said it had no plan to buy the remaining shares in SABIC, the world’s fourth-biggest petrochemicals firm. Aramco plans to increase its refining capacity from 4.9 million to 8 million to 10 million barrels per day by 2030.